Legislative Democrats and Republicans generally had praise for parts of Governor Jerry Brown’s California budget proposal. But they raised concerns as well. Democrat Anthony Rendon, who takes over as Assembly speaker in March, says he’s not sold on the governor’s $1.5 billion proposal to consolidate preschool and transitional kindergarten programs. "It is a significant departure from the way that early childhood education has always been done in this state, and a departure from the way it’s generally done," says Rendon. "We have made it very clear that we are reluctant to give any support for that right now, given we haven’t seen any of these plans yet," says Melendez. The managed care organization tax would require GOP votes to reach the supermajority support it needs to pass the Legislature. ORIGINAL California Gov. Jerry Brown on Thursday proposed a $170.7 billion spending plan that would boost K-12 education, hold college tuition flat and tuck billions of dollars away in savings. The plan is for the fiscal year that starts July 1. The budget, which includes a $122.6 billion general fund budget and various other special funds, is up about $3 billion from the budget the state adopted last summer. 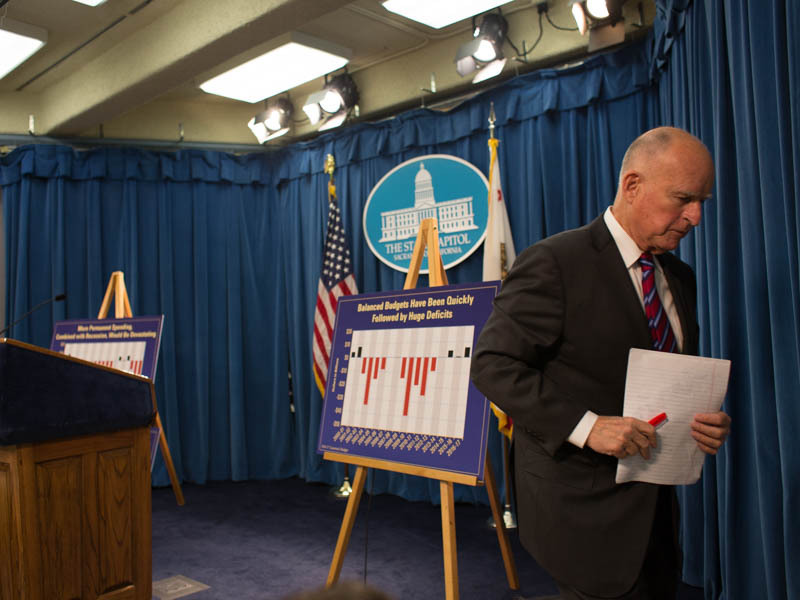 “Relative to other years, the budget is in good shape,” Brown told reporters during a press conference at the Capitol. Brown’s proposed spending plan would add $3.5 billion to the state’s voter-approved “Rainy Day” savings fund. That pot of money is expected to grow to $4.5 billion by the end of the current fiscal year and to $8 billion by the end of the next fiscal year, under the governor's proposal. Brown said the savings is critical to withstand future revenue declines. "Building up the fund is the best insurance policy against deep budget cuts in the next economic downturn," he said in a press relase. On K-12 education, the governor's budget proposes to increase per student spending by nearly $3,600 compared with five years ago. Democratic and Republican state lawmakers praised Brown's plan to spend more on education, though some said funding increases aren't the only answer. “I am pleased to see continued increases in school spending per student, but history and data shows that funding alone will not improve student outcomes," Assemblywoman Kristin Olsen, R-Modesto, said in a statement. "We have to be willing to pass meaningful reforms to improve the quality of education in our state." “It’s not a terrible plan," added Sen. Bob Huff, R-Los Angeles County, in a news release. Huff added, however, that he opposes the governor's call to tax health care plans to close a $1.1 billion shortfall in the spending plan. That short fall is caused by the federal government no longer authorizing an existing California tax on health care plans. Huff also criticized Brown's plan for taxes or fees to pay for California’s crumbling transportation infrastructure. On higher education, Brown said his budget would keep tuition flat for students at the University of California and California State University campuses, leaving rates at 2011-12 levels. The Legislature will hold budget hearings in coming months as it forms its own spending proposal. Check back here for updates on the budget throughout the day. An earlier version of this article incorrectly said Brown's budget would add only $2 billion to the state's Rainy Day fund. 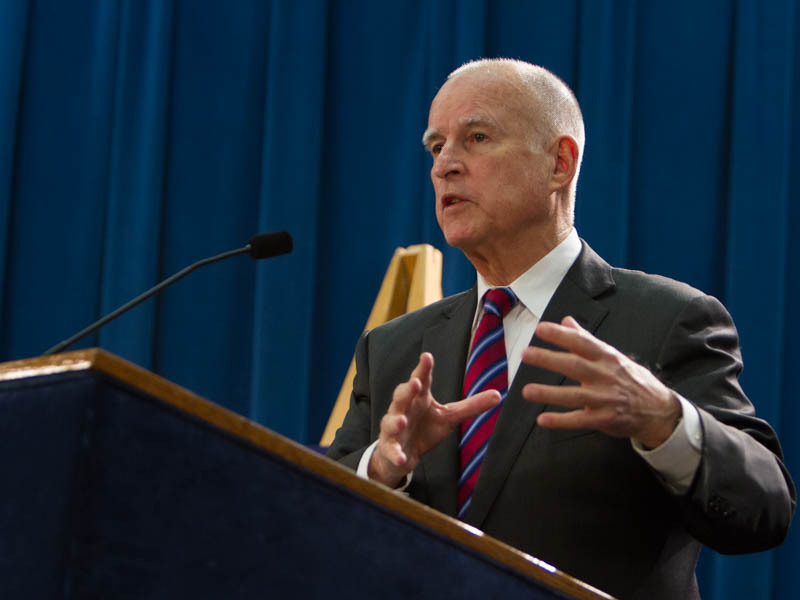 California Governor Jerry Brown was in his element when he introduced his annual January budget proposal yesterday at the state Capitol. He waved charts and warned of looming recession, even as he called for new taxes. Gov. Jerry Brown poured cold water on the hopes of California Democrats, unions and advocacy groups as he released his state budget proposal Thursday, criticizing two major progressive priorities headed toward the November ballot. California Governor Jerry Brown is planning to release his proposed spending plan for the next fiscal year Thursday morning. 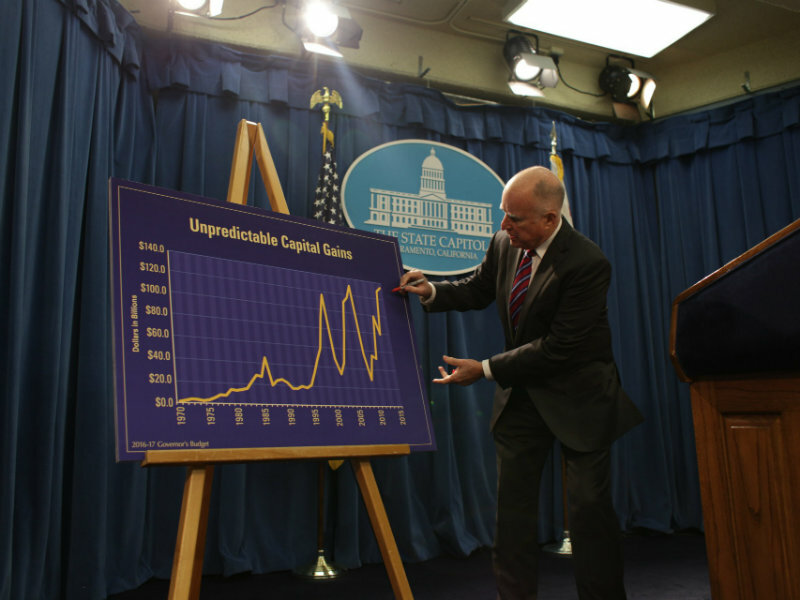 CapRadio’s Ben Adler Joins Insight from the floor of the California Senate to preview the governor’s spending plan. Gov. Jerry Brown will give a first look at his priorities for the coming year when he releases his California budget proposal Thursday. It will include a proposed restructuring of a tax on health insurance plans to avoid a $1 billion budget gap.